Welcome back for another great month of the Pavelka Project! This month we a doing another more ‘open-ended’ project for you. This month we are using the book, Quick & Easy Gifts with Polymer Clay, and using the Pet Project idea. I know many of you don’t have pets, so you do NOT have to create a pet jar, but you DO need to decorate a jar for this month’s project. Lisa offers literally dozens of ideas throughout all her books on techniques, color palettes, and so much more. [Order your books here] I also have over 150 tutorials here on the site you could use to get ideas to decorate your jar. Don’t Forget: You MUST in some way decorate or cover a jar with polymer clay. Use a jar & cover it with clay. 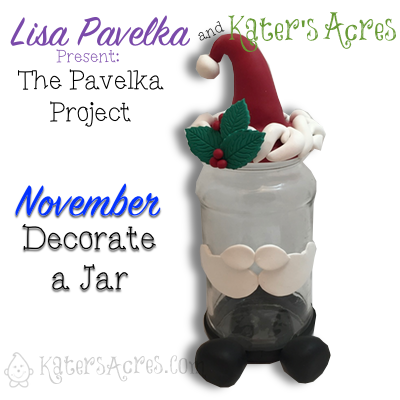 You can use the projects in the book and make your own Pet Jar or make a season santa jar. TIP: Recycle an old Ragu jar to make your project. You do NOT have to buy a glass jar, recycle something you would throw away anyway. Your choice of polymer clay (amount and colors of clay needed will vary depending on the cane being made, its complexity and theme). TIP: I chose Soufflé clay by Polyform as it is lightweight, strong, & would NOT add a lot of weight & bulk to the already heavy glass jar. Wash & clean your jar to get any “film” off the glass. I used an old soft toothbrush with some Dawn dish detergent on it. Scrub your lid clean as well, paying special attention to the part that will be threaded onto the glass. If there is still stinky gunk from the glue used to hold on a label, try to use some Goo Gone on the glass and it should wipe clean. Make sure your pieces are completely dry. TIP: I did this the night before I did my project so it was ready the next day. First choose your clay and thoroughly condition it by hand or using a pasta machine. Take the LID of your glass jar and cover the edges with a rope of clay, securing with small drops of PolyBonder as you go. Add a drop of TLS to the top of the jar & spread around with your finger. Make a large teardrop with your clay and flatten the bottom with your fingers to make a flat portion to sit on top of the jar. Place the teardrop on top of the lid, being sure that the flattened portion meets up with the clay surrounding the jar rim. Thoroughly blend the seams using your fingers or sculpting tools. Add white clay around the edges to resemble “fluff” on Santa’s hat. TIP: If you have a white boa, you could glue this around the jar edge after it’s done baking. Use Lisa Pavelka leaf cutters and cut some leaves out of a slab of clay run on the 3rd largest setting of your pasta machine. Add them to the center or side of your hat for some added decoration. (Feel free to add a few red “berries” too). Roll your black clay on the 3rd largest setting of your pasta machine. Place the jar on the sheet and cut around it using a blade. Place some PolyBonder on the bottom of the jar and gently press the round shape onto the bar. Cut a strip of clay about 1/2″ tall that will fit around your glass jar and press it to the bottom piece and up the sides of the jar. This will give the illusion of pants! Add two teardrops and shape as you’d like to resemble boots for Santa. If you would like you can also cut a beard & mustache shape from white clay. 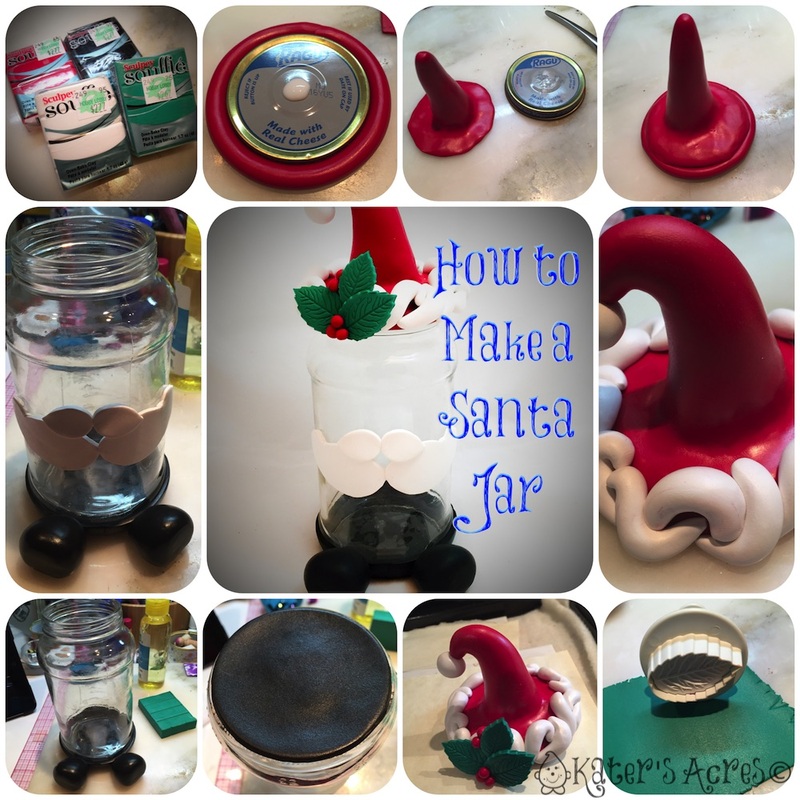 TIP: The Hat & Boots alone will still make your jar look like Santa. BAKE with the lid OFF the jar and all pieces covered in foil for 45-60 minutes at the recommended temperature for your brand of clay. Use these cute jars to spice up your Christmas gift giving this year. Add candy or dry recipe ingredients and give as gifts. Add candy and place on your mantle for guests to enjoy. Fill it with dry hot cocoa powder and some mini marshmallows and give to your co-workers this year. Fill with pine, acorns, pinecones, and a few twinkle lights and this decorated jar with have a life of it’s own! FRIENDLY REMINDER: At the request of many, I have been trying to keep my tutorials extremely basic to allow you a jumping off point. Please note that this month’s Lisa’s tutorials in her book are also very easy. You do NOT have to make an “easy” covered jar. You can make whatever kind of covered jar you’d like to make. I would encourage you to try using PolyBonder if you haven’t already. It’s an ingenious invention that I can’t do without. Great Lisa! I can’t wait to see what you will make!